I’ve recently been reading The Once and Future King by T. H. White which consists of four books, the first of which is entitled The Sword in The Stone. For anyone into classic animation, this is the same story that was made into an animated feature by the same name. The film is very enjoyable, but as with all adaptations, it makes a few changes from the book in order for the story to flow better on film. In my opinion, they chose wisely as the book flows at a very odd pace, which brings me to my first point. I’m not quite sure how to describe what age group this story is directed towards. The film is very much a children’s film intended for families. The book, however, is much too heady, in my opinion, to be classified as a children’s book. The book goes very deeply into detail in regards to certain things such as tilting (jousting), which takes up a rather large portion of certain chapters. The dialogue can also be difficult to understand as many of the terms that are used may be foreign to many readers today. The plot centers around a young boy, The Wart as he is called, who will later grow up to be King Arthur. The Wart is an adopted son to a man named Sir Ector, who has a son named Kay who is two years older than The Wart. The film depicts The Wart as a sort of Cinderella character who lives a life of servanthood and shame underneath superiors. The book, however, is not like that at all. Sir Ector is a very kind-spirited man, and The Wart and Kay get along fairly well. Together, the two of them go on adventures, many of which are set up by their tutor, Merlin. Throughout the book, Merlin, who is a magician, changes The Wart into several creatures in order to teach him about them. The lessons he learns are thorough and full of deeper meaning, however the book seems to leave all the lessons as rabbit trails rather than bring them into focus later on. I didn’t mind this, as it made the book less on the nose with its message, however it seemed to flow rather inconsistently. Overall, the book does a fantastic job of describing historical things such as tilting and hawk flying, and it also describes Old England in very rich detail. It also does a frighteningly good job of describing the creature points of view when The Wart is changed into creatures such as a hawk, an ant, an owl, and several others. These cleverly detailed detours from the main story made for some interesting reading. My main issue with the story is that is doesn’t always seem to be going anywhere. It feels like it was intended to be extra for those who are already very familiar with the story of King Arthur. At times it does well as a good set up for King Arthur, but at other times it seems very much just like a story meant to fill in the gaps. 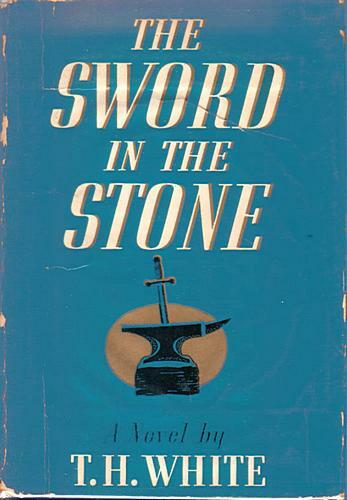 The author, T. H. White, does very well at running with the character of the Wart, but the second portion of the larger story of The Once and Future King seems as if it is leaving out a lot of major plot points as less than half of the book follows King Arthur’s story, and the little I have read of the third portion feels similar. To conclude, I haven’t enjoyed The Once and Future King as a whole, however, The Sword in The Stone seems so far to be the best of the lot. For the rest of King Arthur’s life, I would recommend looking elsewhere, (and there are ALOT of books dedicated to his life) however, if you are looking for an entertaining, cleverly written story about the early days of King Arthur, The Sword In The Stone truly is an enjoyable read. I would recommend it to anyone who, as C.S. Lewis would say, is old enough to start reading fairy tales again. Did you enjoy this review? What’s your favorite King Arthur story?